Wednesday, March 7, 2018 Well, its going to be really cold in Alabama tonight and tomorrow night – freeze warning cold. So we bugged out at 6:45 this morning, leaving Tuscaloosa before there was any traffic. It was a beautiful drive with light traffic all the way. Just south of Tuscaloosa we had a bald eagle flying in perfect view of our big windshield. Beautiful bird. We made a stop at the Mississippi Welcome Center to have breakfast and then a stop at the dump station. We don’t have an easy sewer outlet at Anne’s Mom’s house so this was easier. 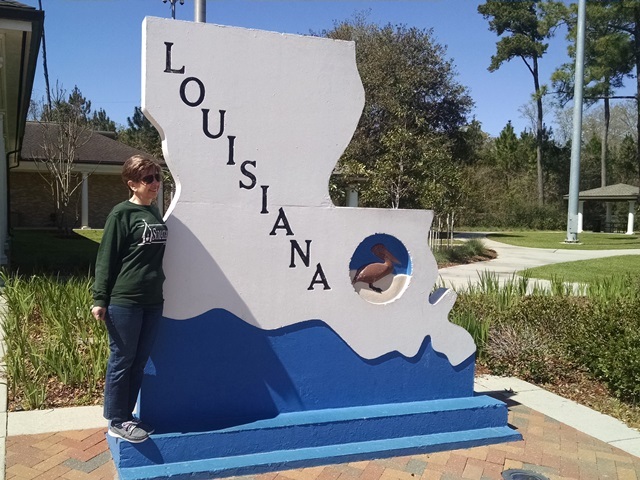 Next stop was the Louisiana Welcome Center. Here we picked up some information on Baton Rouge and the surrounding area to give to our team members. There seems to be many interesting places to visit on our off time. 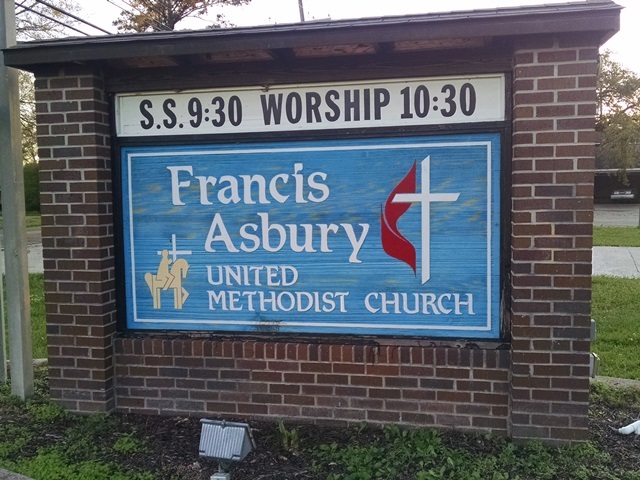 We arrived at the Francis Asbury UMC in Baton Rouge about 1:40 this afternoon. Glenda, the Volunteer Coordinator for the Louisiana Conference of the UMC, met us here. We have been exchanging emails since last fall so it was nice to put a face with the name. She is quite organized and frequently supplied answers before we asked questions. She has worked previous relief efforts working with volunteers so she has probably seen it all by now. She has been in Baton Rouge for a long time and is a wealth of information about the area. Rev. David Melville, pastor of the church was also here when we arrived. He will be serving as our host here at the church. This church had 2.5 feet of water in all its buildings last fall when Hurricane Harvey dumped all the rain in this area. The church at one time had over 300 members and the facilities to handle that number. Now, the small elderly congregation of about 50, had no way of rebuilding after the flood. Since they have a nice campus with ample parking the conference stepped in and took over the real estate, and made it a disaster center. The congregation now worships in a smaller area of the church and the remainder was remodeled with male and female bunk rooms, bathrooms and showers, to house volunteers. 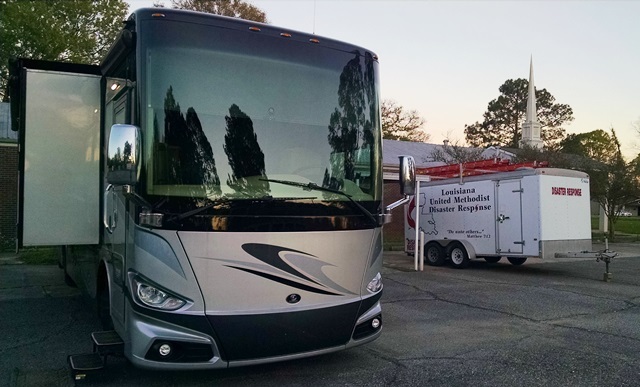 They can now house 64 volunteers at a time plus parking for 6 RVs. Guess that’s enough information for tonight. We will be visiting some job sites tomorrow and probably have lots more to tell. Of course, we have also found the doughnut shop nearby. It’s really good to be back to work. By the way, we also got another good report on Aunt Helen today. God’s got this.